I'm from Austin, Texas, but moved out to California in 2009 after marrying my husband Laren, who is also my partner at Rose & Fitzgerald. We've called San Diego home six out of the last nine years. The other three (from 2012-2015) were spent living in Uganda, Africa, as part of Laren's work with Bridgeway Foundation, a vital partner to some of the world's leading development, human rights, and conflict resolution organizations. In college, I studied communication, and prior to starting Rose & Fitzgerald, worked in marketing and branding for several years. Laren and I currently live in a small coastal town north of San Diego called Cardiff-By-The-Sea, and have a 2-year old little boy named Cade. Rose & Fitzgerald is a small collection of distinct home goods and jewelry that my husband and I design and use in our day-to-day lives. 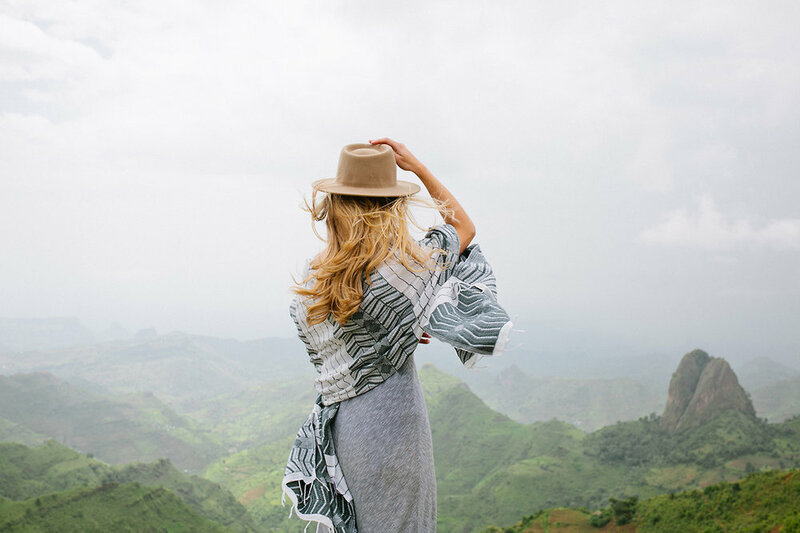 Every single item is ethically handcrafted from start to finish in East Africa by talented artisans, weavers, carpenters, chiselers, and metal-smiths. We're all about effortless, lived-in luxury and we celebrate the perfectly imperfect. We have a love affair with Africa, so creating and sharing beautiful goods made with a soul and story, using natural, local materials from within the continent, brings us great joy. We also have amazing wholesale partners all over the country. A few of them are listed here. Early on in our time in Africa, I developed the idea for Rose & Fitzgerald. The company name comes from my middle name, Rose, and my husband's middle name, Fitzgerald. It felt very fitting to name the company after us since it was born from this adventure we were on together. Uprooting our lives, and leaving my job and community in San Diego felt like the craziest and most exciting thing we'd ever done. And although starting Rose & Fitzgerald was never the intention behind our move, its creation was a natural by-product of us falling in love with the local craftsmanship and materials we discovered in our adopted home. When we moved into our new house, I started designing home goods and commissioning local artisans to bring them to life, which was all out of a need to compliment our lifestyle and make this new, foreign place feel a little more like "us". The goods came back so stunningly beautiful and high-quality, and I knew I wanted to share them with the world. I believe that we're unique because we aren't solely driven by profit (we're independently owned and operated) and we don't just create more products for the sake of having something new to offer. Truly, we're just about offering a small collection of timeless goods that we love, that aren't already saturating the market, to individuals who care about the origin story and materials. We're small but mighty, and above all else, we aim to be authentic in what we do and create. We really love our customers, retail partners, and our small team in Uganda. My favorite Rose & Fitzgerald product, currently, is our Soapstone Rounded Vase. It is the most unique, beautiful vase because of its creamy peach tones and unique marbling. It is surprisingly heavy, buttery smooth, and each one is completely one-of-a-kind. It is beautiful with or without anything in it, which makes it perfect for the tabletop, a mantle, or a bookshelf. The soapstone is mined from a quarry in Kenya, and it's not a material you often see - making it unique and rare.